President Trump and Russian President Vladimir Putin shake hands during a meeting on the sidelines of the G20 Summit in Hamburg, Germany, on July 7, 2017. The two leaders are expected to meet again over the summer. 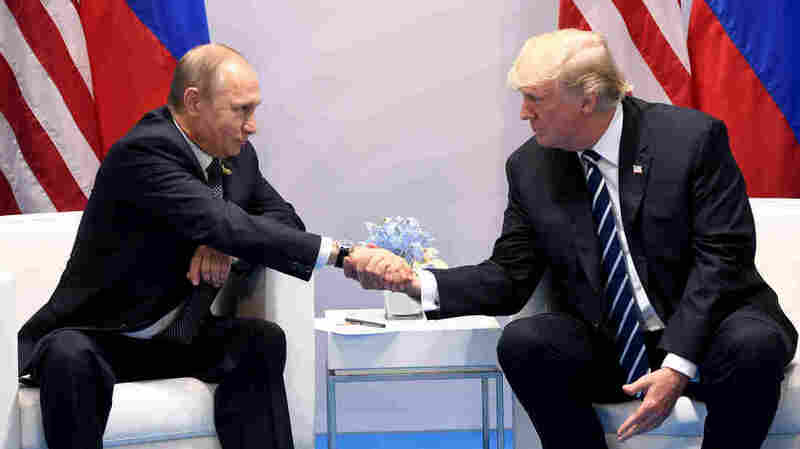 President Trump is planning to hold a summit meeting in the near future with Russian President Vladimir Putin. The date and location of the meeting are to be announced on Thursday, but Trump said it's likely to happen soon after he attends a NATO summit in Brussels next month. "A lot of people have said or implied over time that a meeting between President Trump and President Putin would somehow prove some nexus between the Trump campaign and the Kremlin, which is complete nonsense," Bolton said. "The president recognizes there may be some criticism of this decision to have the meeting. You've heard some of it here today. But what must guide his cond uct of American foreign policy is the pursuit of American national interests. And he judges â" correctly in my view â" that this bilateral summit between himself and President Putin is something he needs to do and will do, regardless of political criticism at home."